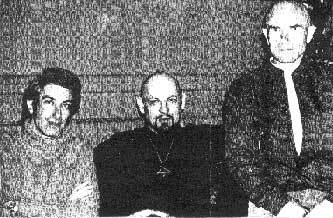 Jacques Vallee with Anton LaVey and Aime Michel. Vallee: I think that's exactly what we have to do with UFOs. We have to do something that will cause them to react. And I don't mean building landing strips in the desert and waiting out there to welcome the space brothers. Vallee: I hesitate to be too specific. I'm speaking, as I'm sure you understand, of the attempted manipulation of UFO manifestations. I know a little something about that subject. And I'm about to go out on a very long, creaky limb by telling this little story. In the past decade or so, the bizarre nexus of UFOs and the paranorma has emerged from the dustbin of Ufology, thanks to pioneers like Vallee, John Keel, and a rapidly growing group of researchers (see references at the end of this article). In some ways, the UFO/Occult nexus has become a cottage industry, and has occasionally broken through into the mainstream. But when my particular incident occurred, Ufology was primarily entrenched in the "nuts-and-bolts spaceships" extraterrestrial hypothesis (ETH) camp. But on with my particular piece of this puzzle. In early September of 1990, I spend a few days at Ocean City, Maryland, a resort town on the Atlantic. I went to the beach with a few friends, and we passed the time making sand sculptures. Since I was reading a lot about UFOs at the time (it was the 90s, after all), I sculpted the head of a prototypical "gray" alien in the sand, with his arm raised above his head as if waving hello. A couple of weeks later, I returned to Ocean City for the weekend. One evening, I had a very vivid dream about a television panel discussing UFOs. One expert was a Phil Klass styled skeptic/debunker, another was a Jacques Vallee-type, the third was a Stanton Friedman nuts-and-bolts ETH proponent, and the final panel member was a raving paranoid "the lizards in their underground bases are eating our children!" conspiratologist. The panelists bantered back and forth until the paranoid guy started ranting: "They're cooperating with the government! They're stealing our children and the government knows it! The Men in Black are demons!" The other panelists chuckled and rolled their eyes. I awoke from the dream, disturbed. I seldom had dreams related to UFOs, and this one was particularly realistic. I found that my thoughts kept returning to the dream throughout the day. That evening, at approximately 7:30pm, I decided to take a walk on the beach with my girlfriend. It was a very clear, starry night, and we were the only two on the beach. My girlfriend walked along the surf, while I lingered away from the water. I looked down in the sand and saw what looked like a humanoid face sculpted in the sand, though part of it had been obliterated by footprints. I remembered the alien head I had sculputed in the sand weeks before, miles from the spot on which I was standing. Just another synchronicity, I thought to myself. I looked up into the starry night, thinking about my dream and the face in the sand. I said, mentally, If you're out there, now is the perfect time to show yourself. I guess part of me secretly wished something would appear, but I certainly did not expect anything to happen. I walked closer to the water and joined my girlfriend. A few minutes later, she pointed to the sky. "What are those?" she asked. 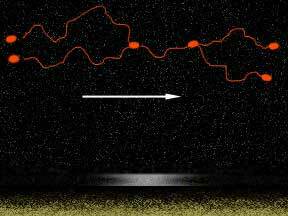 Two orange-red blobs of light were bobbing up and down next to each other far above us. When I looked at them, they shot off across the sky (over the ocean), flying erratically -- almost playfully, changing direction frequently. At one point, they merged, flying as one unit, then split apart again. We watched them, stunned, until they vanished on the horizon amidst the light pollution from Ocean City's boardwalk. "Oh, my God," I said, over and over, as we followed them. I couldn't say anything else but "Oh, my God." I was simultaneously awed and frightened. When the lights disappeared, we both returned to the car and drove home, elated but also unnerved by what we had seen. I can only think of a couple of theories to explain what happened. One is that I was part of a lucky train of coincidences, a chain of synchronicity -- sculpting a face of an alien in the sand, dreaming about the UFO panel, stumbling upon a similar face in the sand weeks later, asking for an appearance, and getting much more than I could have imagined. The other possibility is much more intriguing, but raises all sorts of troubling questions. It suggests that UFOs are a multidimensional phenomena (bending time and space), that they interact with human consciousness on an intimate level, and that they can potentially be summoned. Far more frightening is the possibility that whatever it is, it observed, drew upon, or manipulated my consciousness, my dreams, and my perceptions leading up to the sighting. If it wasn't for my girlfriend sighting the objects first, I would concede the possibility that it was a hallucination. She knew nothing of my silent request to show me something, and pointed out the objects before I saw them. One of the foremost researchers into the fringes of Ufology is my friend who goes by the name of Blue Resonant Human, or Brother Blue. Although he dropped out of sight in the late 90s, his prodigious postings to USENET made him a Net celebrity, and his unconventional (and funny) writings made him the object of scorn of hardnosed skeptic and harebrained new ager alike. One of his missives is archived here. I will pull out some pertinent bits, but I strongly recommend reading the entire article. Doctor Vallee gave the Gallic form of the classic scientific Not-Speculating-Beyond-The-Data head-shake. "I can theorize, and theorize, endlessly," he said, "but is it not better to just study the data more deeply and look for clues?" Crowley also figures in one of the seminal (ahem) incidents in this murky, bizarre field. 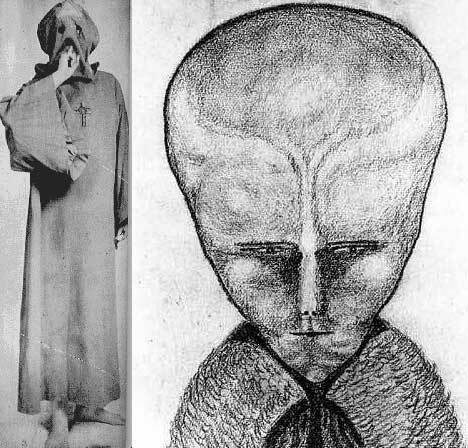 The most discussed episode is Crowley's alleged contact with an entity known as LAM (illustration above) as part of his "Amalantrah Working" -- an occult process designed to facilitate "the establishment of contact with non-human intelligences." Instead of rehashing this story here, I will point the reader to this article. Googling Crowely and LAM will yield many variations of what is essentially the same account. An egregore is a kind of group mind which is created when people consciously come together for a common purpose. Whenever people gather together to do something and egregore is formed, but unless an attempt is made to maintain it deliberately it will dissipate rather quickly. However if the people wish to maintain it and know the techniques of how to do so, the egregore will continue to grow in strength and can last for centuries. An egregore has the characteristic of having an effectiveness greater than the mere sum of its individual members. It continuously interacts with its members, influencing them and being influenced by them. The interaction works positively by stimulating and assisting its members but only as long as they behave and act in line with its original aim. It will stimulate both individually and collectively all those faculties in the group which will permit the realization of the objectives of its original program. If this process is continued a long time the egregore will take on a kind of life of its own, and can become so strong that even if all its members should die, it would continue to exist on the inner dimensions and can be contacted even centuries later by a group of people prepared to live the lives of the original founders, particularly if they are willing to provide the initial input of energy to get it going again. I offer this information as food for thought, not because I can assert that it is truth, or even partially true. But I cannot deny my own experience, which has convinced me that, at least in part, the UFO phenomenon interacts with humans on a psychic (i.e. non-physical) level -- the level of dreams, synchronicity, and consciousness. Some references for those interested in pursuing this line of thought are listed below. Caveat emptor.